Data centres - speed of light towards digital real estate. Not all architecture is static, on the contrary, there is a global real estate positioned at the interface between the digital and physical world which is ubiquitous and kinetic. It is emerging from an intercontinental cloud’ of mission critical facilities comprising trans-ocean landing stations, repeater nodes, hyperscale and proximity data centres joined together by a global network of unseen fibre optic cables enabling data to travel at the speed of light connecting organisations and individuals across the planet. Increasingly these mission critical facilities are no longer discreetly located within the stealth architecture of stand-alone facilities, they are ubiquitous: whether embedded within an airport, office, factory or research laboratory physically connected to the users which rely on them and complexes which power them. Here Iain McDonald, Director of Advanced Technologies explores this further. Not all architecture is static, on the contrary, there is a global real estate positioned at the interface between the digital and physical world which is ubiquitous and kinetic. It is emerging from an intercontinental cloud’ of mission critical facilities comprising trans-ocean landing stations, repeater nodes, hyperscale and proximity data centres joined together by a global network of unseen fibre optic cables enabling data to travel at the speed of light connecting organisations and individuals across the planet. Increasingly these mission critical facilities are no longer discreetly located within the stealth architecture of stand-alone facilities, they are ubiquitous: whether embedded within an airport, office, factory or research laboratory physically connected to the users which rely on them and complexes which power them. Here Iain McDonald, Director of Advanced Technologies explores this further. Increasingly meta projects under the umbrella term ‘Smart City’ or new build and adaptive projects which we term ‘Smart Block’ reflect the convergence of data and energy within emerging architectural typologies which will be the embodiment of what can be termed Digital Real Estate (DRE). At Scott Brownrigg we are analysing and manipulating data, particularly how non-cultural entities will shape our experience of the city and the pervasiveness of ‘sentience’ as sensors become ubiquitous in urban environments also what Ray Kutzweil describes as the ‘singularity’ ie the processing capacities of machine perception and reasoning. This is informing our urban planning strategies at a meta level ie digital real estate and the sentient and sensual city invested with ‘new and unexpected functionalities and meanings.’ Is modernism re-emerging as big data? where in machine learning and artificial intelligence join than human aesthetic, taste and spatial requirements as determining factors. Florida and Glaeser consider the sensitised city to be based on the knowledge economy. The notion that the smart city is both sentient and sensual based on the identification of millions of elementary occurences from individual consumption to atmospheric quality. Using real time data the smart (kinetic) city is able to master situations and scenarios – but is it top down or bottom up? ie a neo-cybernetics inspired or collaborative city. Already more than 50 billion connected devices are sending data online but if hyperconnectivity is a marker of urban disparity and integration, smart cities may be no better than the urban networks of the industrial era unless there is more than one model. Critics posit that ‘the commoditisation of digital real estate is a physical manifestation of the monetisation of the citizen’. By contrast Picon advocates there is no collective intelligence without shared values and that smart cities are destined to become the melting pot of a new collective morality.’ We would contend that ‘smartness is not just about creativity and that the era of the industrial city is not over rather it is transforming, re-tooling, with the disruptive potential of Industry 4.0, countering the cultural and economic ‘tunnel’ effect. 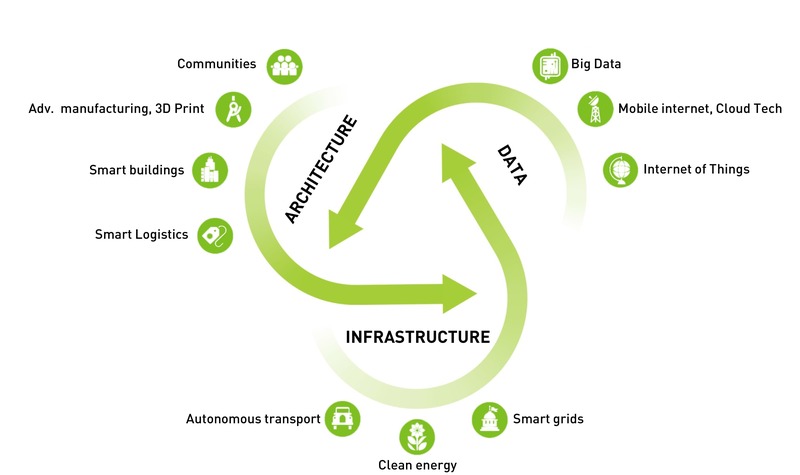 Paradigmatic shifts are taking place in scientific processes (E-Sciences) and industrial policies (E-Infrastructure) which are having a strong impact on how our cities are developing. In fact, although abstract values such as computational capacity and communication technologies are swiftly imposing themselves as decisive parameters, space has by no means become an obsolete category. On the contrary, these processes are deeply rooted in the dynamic strategies shaping the built environment on the one hand and the real-estate market on the other, requiring both a critical, political and technical re-appraisal from the architectural profession city managers. 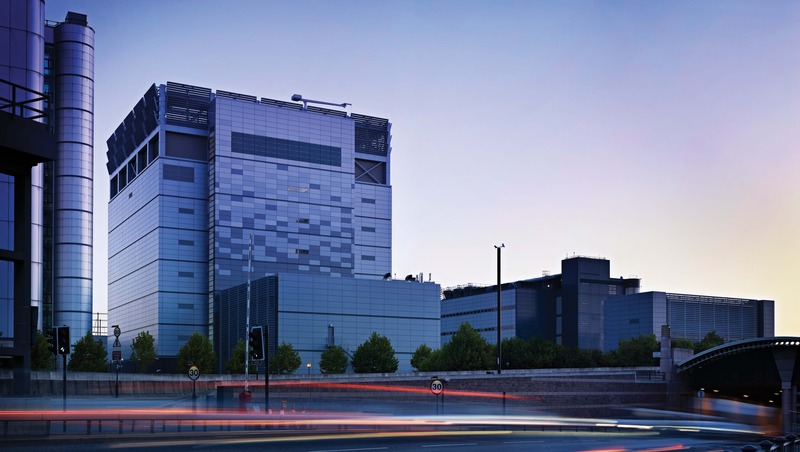 In a world where facilities are required to run 24/7/365, where availability demands range between 99.67% and 99.99% (downtime is valued at £6,5 million per hour in the case of a financial brokerage operation), where structures need to sustain loads of up to 15 kN/sq m, where mid-size facilities with a 250kW UPS can be expected to spend £200,000 PY on power, it is clear that we are facing extreme infrastructure demands. At the scale of a city block or individual building, reference to existing form still proliferates in this nascent transformative scenario. Similarly the cartographic dimension found in abstract art and decorative fascination of parametricism will not in itself generate a new aesthetic to influence public perception. Our response is to combine analogue skills with augmented reality to shift architectural composition away from a two dimensional plan generated process, to connect the physical construct with digital content, avoid interiorisation and understand how we move through built space. 30 degrees centigrade pointing to increased automisation without increasing PUE as exemplified by our current design for a tall data centre in Hong Kong where the likelihood of cooling chips at source within performance envelopes developed from bio-mimicry will utilise composite materials to counterbalance an increase in skeletal strength. In this scenario we envisage robotically maintained data centres running hotter. With fibre services now moving from 10Gbps to 100Gbps uninterrupted power supply remains crucial to keeping the world online. Whether in a suburbanlocation, self reliant on its off-grid energy production and data storage (Interxion’s Campus, Frankfurt), an urban development recovering energy from a data furnace (Telehouse West, London) or a research campus powered by a High Performance Computing facility (MareNostrum,Barcelona) what is at stake is the future of our productive landscapes determined by big capital investments, algorithms and efficiencies contributing to the progressive development of a new European industrial culture. What is clear however is that non fossil fuel sources of generating electricity such as wind wave and solar power which have enjoyed significant subsidy will not generate sufficient megawatts to prevent downtime. Nuclear fission can provide significant quantities of carbon free power particularly Small Modular Reactors (SMRs) which have the potential to provide efficient, rapid deployment of electrical power where it is required. In order to continue and grow the deployment of nuclear power a complete rethinking of the design, construction, licensing and operation is necessary, capable of delivering a modern deployable fully scalable Modular Urban Nuclear Reactor. To do this several engineering and architectural challenges have to be addressed to gain regulatory approval and public acceptance. How Small Modular Reactors (SMRs) are designed will be the key determinant in changing perception of what is safe energy. The impact of such a breakthrough in gaining public acceptance will provide the platform for co-locating resilient power facilities with the new urban mix of real estate where innovation, advanced manufacturing, research and new forms of commerce increasingly take place. It will locate sentient power blocks in urban areas as opposed to sensitive rural locations. Importantly it will enable advances in technological and material science to be fully exploited in design and construction. The completely novel concept introduced in 4, is key to fast deployment and continuous improvement, and greatly supports the aspect of public acceptance. Three dimensional design and simulation methods, coupled to innovative materials will be key in addressing core design with low-enrichment fuel, particularly challenging for a small footprint reactor. Autonomous operation, will introduce new challenges, but also great opportunities. Architecturally defining building configurations which accommodate human, automated and technological developments allied with an ultra lightweight structure (by comparison) to optimize form, cost and construction as well as facilitate advocacy will be paramount. If the Smart City is increasingly defined as the management system of urban data (software), we see the Smart Block as the physical enabler (hardware) of the contemporary digital urban ecosystem. 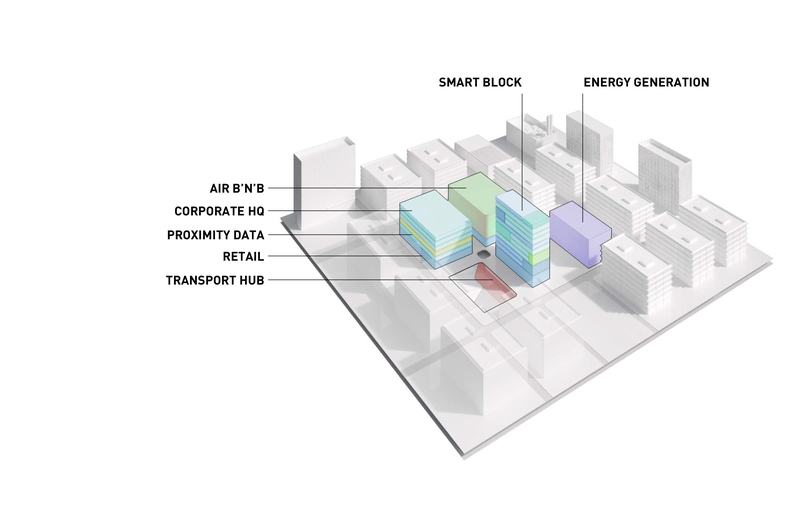 The Smart Block is a dense city node concentrating innovators, transport, machines and infrastructure in one place. It enables to unlock development beyond the twentieth century segregation of industrial land from city life in so much as it aims to transform the perception of contemporary production through the innovative architectural resolution of its envelope. Our value proposition for the Smart Block envisions a scenario in which the geography of innovation is defined by the localisation trend of both IP and new technologies, essential for a digital economy to thrive and scale up. At an urban level the Smart Block has the potential to unlock development within industrial land allocation. Our research has generally found that the largest components of industrial land demand tend to be big B8 or B2 sheds, which are usually not compatible with mixed-use development, as they require 24 hour operational access and are noisy. However past experience in the data and energy sector suggests Smart Block could prove as a disruptive element in the traditional attempts at mixing production, living and recreation within urban environments. 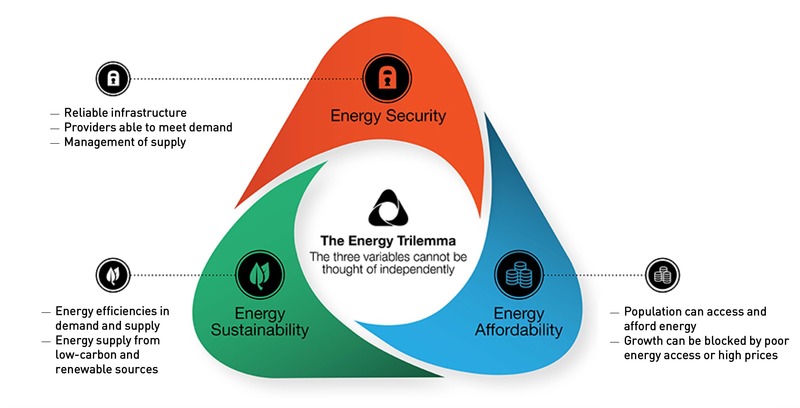 The emergence of technologies such as DC free-cooling (ie less energy hungry and less noisy) and energy generation such as SMRs will impact strongly on the opportunities of merging populated environments in close proximity to the infrastructure essential to a global economy. As a self-contained urban element the Smart Block responds to a new form of urbanity for the digital economy which has been described as a clustered network. At an architectural level, our focus on building design and performance envelopes will reflect and give form to today’s reality of “bits and bricks” where networking, infrastructure and space are intertwined. If digital design and fabrication are restructuring production spatially, functionally and socially then to paraphrase Carlo Ratti: “Our role as architects is the choreographer of dynamic and adaptive forces rather than scripting outcomes in a deterministic way.” The envelope of the Smart Block becomes an active interface for both human and non-human factors. In parallel to its ability to actively control fluid dynamics and environmental exchanges it is an active element for the reconfiguration of spaces and perceptions. This becomes not only necessary in terms of its public acceptance which leads to real estate value, but also for architecture to be able to communicate and adequately reflect and attract values and lifestyles of its future users. Today’s teenage generation loves to make, invent, and design things, as a way to be heard. “They, (13-21 years old, labeled Generation K) do not know any different. This is their world – this digital ecosystem is their normality”. Despite being constantly connected to friends via social media, Generation K are deeply lonely. 80% said they prefer hanging out with friends face-to-face, rather than online. Hertz remarks “Physical interaction comes at a premium in this digital world,” Typical top-down planning policies may not be sufficient to disrupt the polarisation of growth and production given current environment of “market realism”. In order to reposition ourselves as agents of change, a different more entrepreneurial attitude will be requested: this could mean a much closer relationship with the customers (ie technology provider and tenants) to identify new high-value building types and technologies able to generate both positive ROI for developers and place-making. The unifying element of this new reality travels at 186,000 miles per second.